Rock N Gold Creations services your fine jewelry and time pieces throughout the Greater San Diego area. Rock N Gold Creations offers full professional jewelry appraisal services. Our appraiser offers 30 years of professional jewelry appraising experience and is a graduate of The Gemological Institute of America. An appraisal is a prepared document to that can be used for many purposes such as obtaining insurance on your jewelry. Your appraiser is your advocate... so be helpful answering any questions they may have and bring any supporting documentation with you to your appointment. Insurance Appraisals – This is our most asked for service. This is a very thorough document, accurately describing your jewelry and the current market value of the jewelry. If the item is lost or stolen, the information containing in this report will permit a new item to be created. With this, you can obtain coverage, for that specific item, from your Homeowner’s Insurance carrier or an Independent Carrier. 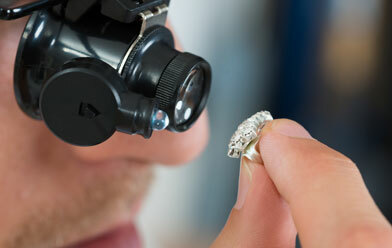 Types of insurance available for jewelry - Insurance companies vary on their replacement policies. Ask your insurer how they handle losses. Replacement Insurance is the most common. Replacement Insurance – Your insurance company will replace an item, or pay you no more than their actual cost to obtain it, regardless of the value stated on the appraisal document. You want to have current, realistic values, reflecting what is happening in the market. If the value is unrealistically inflated, you will be paying higher premiums for coverage that you will never recover. Appraisals for Other Purposes – There can be a myriad of reasons that you may need an item evaluated. Openly discuss your needs with the appraiser, and you will be best served.